Entry by K.Ayumi on Sat Feb 11 22:54:25 2012.
what is thie poster?? translation please?? 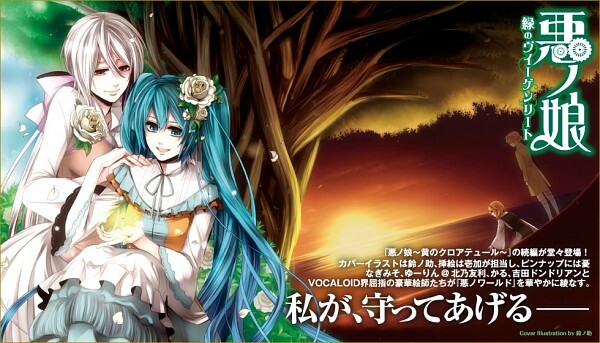 I can't give a translation, but it's an image promoting one of Akuno-P's novels, Wiegenlied of Green. It covers the events of Daughter of White and Thousand-Year Wiegenlied, but goes into a lot more detail (such as discussing the roles of Luka, Yuki, and Neru's characters and showing what happened after Daughter of White). However, it's only been released officially in Japanese, although I've heard of an unofficial Chinese translation floating around somewhere.